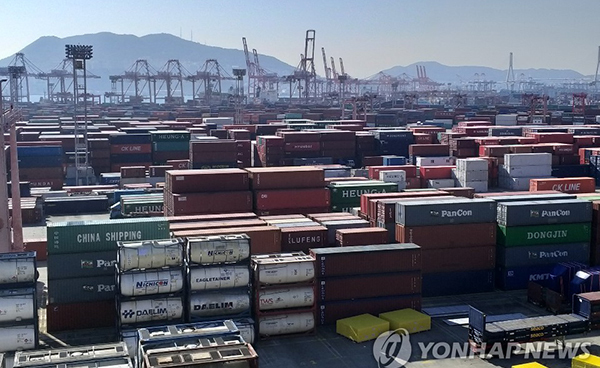 Freight processing at South Korea's largest port, Busan, continued to increase in November, reaching past this year's target to possibly set a record, operators said on Dec. 6, 2018. The latest data showed the port in the country's southeast processed 1.87 million twenty-foot-equivalent units (TEUs) of containers in November, up 11.8 percent from 1.67 million TEUs in the same month a year ago. The increase is the biggest this year. Import-export cargo processing gained 2.8 percent, but transfer shipments rose 20.5 percent. In all, the total amount of freight handled at the port reached 19.37 million TEUs this year as of November, up 5.7 percent from the same period the previous year. Transfer cargo accounted for 10.3 million TEUs, making for an increase of 10.7 percent. Import-export cargo, 9.07 million TEUs, rose 0.6 percent. A tentative tally as of Monday showed the port had handled 20 million TEUs. The year-end estimate is 21.76 million TEUs, which would be record.